Two dates! November 18, 2018 and January 20, 2019 12-2:30PM in Red Bank NJ. This is the continuation of the first potluck that was held last year. Sign up via our form (link), and we will confirm your spot! The last one we held was awesome and we can’t wait for this intergenerational table talk! 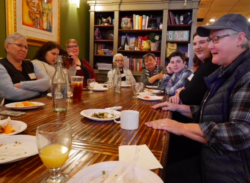 Recent studies show that the aging LGBTQ population lacks connection to community, frequently ages alone or in isolation, and also feels that their activism and civil rights efforts aren’t being shared as part of a common history with youth. Our meet-ups will provide common ground for conversation about LGBTQ history and social justice concerns for both young and aging people.